Oil pulling therapy is a traditional Ayurvedic remedy that helps heal a number of ailments ranging from toothache to heart disease. It is particularly useful for getting rid of dental problems and maintaining adequate oral hygiene. Simply put, oil pulling is an inexpensive and harmless process that involves swishing a vegetable oil in your mouth for 15-20 minutes. The therapy should be followed in the morning, on an empty stomach. You need to use a whole tablespoon of oil for this purpose. Swishing a lot of oil in the mouth, however, tends to be quite uncomfortable for some. Thus, people often reduce the amount to a single teaspoon. It is usually recommended to use organic, unrefined, cold-pressed oils for oil pulling. Sunflower oil and sesame oil are highly recommended in this regard. You can use coconut oil or olive oil, too. Besides, you may also add a few drop of an antibacterial essential oil in the vegetable oil you use for oil pulling. 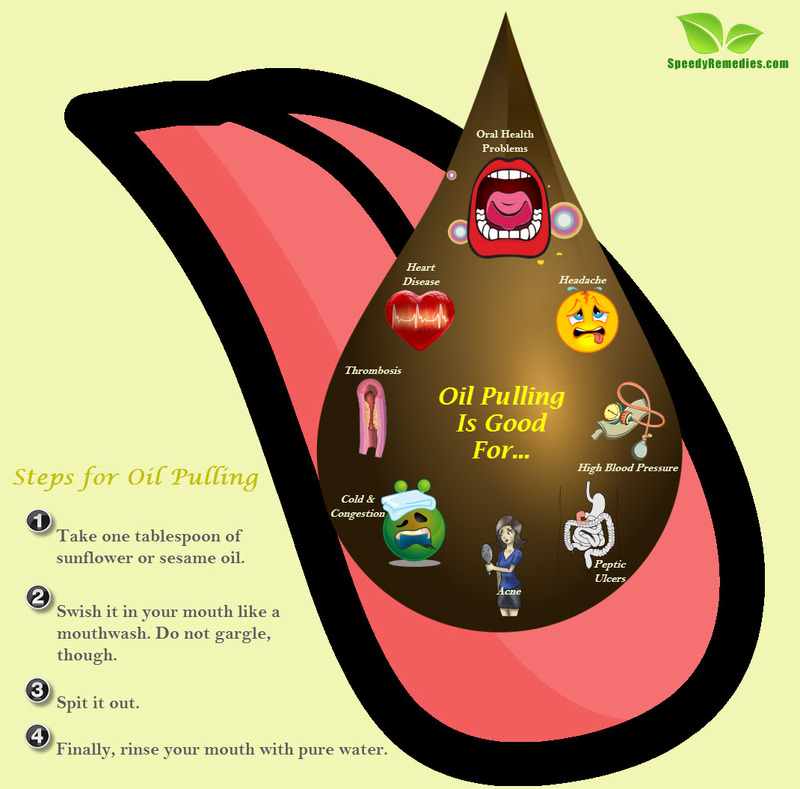 Scientifically, it is believed that the effects of oil pulling are mainly attributed to the mechanical cleaning action due to swishing, rather than the type of oil used. After oil pulling, the oil that you are supposed to spit out should have become thinner, and turned milky and foamy. After spitting out the oil, you can rinse your mouth with pure water (may use warm salt water as well) and then, brush your teeth with natural toothpaste. It is believed that this simple process removes germs and bacteria from the mouth. In fact, oil pulling combats bad breath, relieves toothache, reduces inflammation, whitens your teeth, heals sensitivity, treats dry mouth, removes yellow/white coating from tongue, cures cracked lips, eliminates bleeding gums, fixes loose teeth, and prevents and heals cavities. Gum disease or periodontitis has been linked with increased risk of miscarriages in pregnant women. Plus, there is a bidirectional association between diabetes and periodontal disease. Therefore, it is essential to maintain proper oral health. 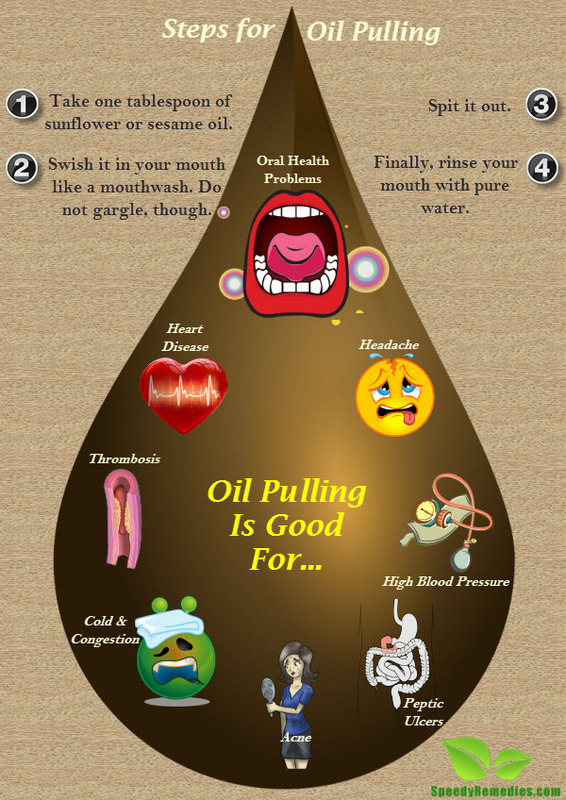 Moreover, oil pulling can clear up congestion and unclog sinuses. It is also considered good for dealing with menstrual irregularities, PMS (Premenstrual Syndrome), and menopausal disorders. Oil pulling helps remove toxins from the body by detoxifying the deep tissues. It improves the functioning of heart, kidney, lungs, lymphatic system, endocrine system, nervous system, and the immune system. In addition, it benefits your health by increasing your energy levels, stimulating metabolism, and clearing the mind. It is good for eliminating beauty problems such as acne, age spots, and helps you maintain clear skin. People have also reported better sleep, decreased allergies, improved vision, and even reduced sugar cravings after practicing oil pulling for months. On the downside, this therapy does seem unpleasant and strange in the beginning. Having your mouth filled with oil can even make you feel nauseous. However, keep in mind that you need not swish the oil vigorously in your mouth. Plus, this unorthodox Indian folk remedy is not going to give you immediate results. You will have to try it for a long time. So, you can expect to see positive results after regularly following the oil pulling therapy for at least a month. Acute conditions, nevertheless, may improve within a few days. Oil pulling should be done first thing in the morning. If you do it after eating something, you may experience nausea. It can be done up to three times in a day (before breakfast, lunch, and dinner). Anyone aged five years or more can practice this therapy. Children aged 5-15 can use one teaspoon instead of one tablespoon of oil. Edible, cold-pressed oils should be used. It is best to follow this therapy before brushing your teeth. If the oil does not become watery in spite of swishing, it indicates inadequate salivation. To avoid this, drink a few glasses of water about 30-45 minutes before oil pulling. Do not swallow or gargle the oil. After swishing the oil in your mouth, you may want to spit it out in the trash can rather than your sink. Although this therapy is not well documented scientifically, yet it is a natural and harmless procedure. Oil pulling is referred to as Kavala Gandoosha or Kavala Graha in the Ayurvedic text, Charaka Samhita. This sounds like something I will try out. Are there anyone that has already done this and if so, what are some of their feedback?